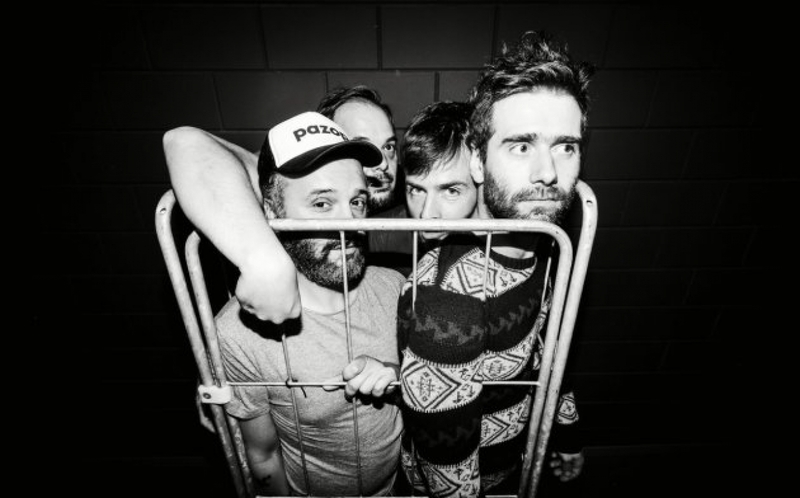 With	their	90’s	Noise	Rock	riffs	and	primal	screams	coming	from	every	fiber	of	their	being,	IT	IT	ANITA	(Belgium)	might	seem	pretty	simple. But	if	you	take	a	closer	look,	you'll	find	some	subtle	nuances	and	intriguing	depth. Besides	seething	fire	there's	also	intense	desire,	crippling	fear,	anger	and	restlessness. Noisy	guitars	and	loud	rhythms	are	on	the	program	of	uncompromising	stage	performances	where	tension	mixes	with	slackening,	where	raw	energy	fights	against	finesse. After	a	first	eponymous	record	(Honest	House	- 2014)	mixed	by	Jason	Sebastian	Russo	(Mercury	Rev), It	It	Anita successively	recorded	two	opus	with	producer	John	Agnello	(Sonic	Youth,	Cymbals	Eat	Guitars,	Kurt	Vile,	Dinosaur	Jr,	Thurston	Moore):	"Recorded	by	John	Agnello"	(2015)	and	"Agaaiin"	(2016),	both	released	on	the	independent	Belgian	label	Luik	Records. The	many	positive	criticisms	aroused	by	the	release	of	these	records	definitively	placed	the	group	as	a	major	actor	of	the	Belgian	Noise	/	Rock	scene. This	success	has	attracted	the	eye	of	many	media	such	as	Studio	Brussel, Humo,	22tracks,	OOR,	Focus	Vif or	even	Mowno. Then,	by	a	lot	of	touring	in	Belgium,	Europe	and	even	Canada,	the	band	finished	to	establish	his	huge	stage	reputation	: Pukkelpop (be),	2	x Dour (be),	2	x Le	Guess	Who? (nl),	Eurosonic (nl),Le	Printemps	de	Bourges (fr), The	Great	Escape (uk), Monkey	Week (Spain), FME (Canada),	etc. «	An	amazing	show	where	belgians	exceeded	all	expectations. » Never	Mind	The	Hype	– EUROSONIC,	Groningen	2016 «	il	s’agit	tout	simplement	du	coup	de	coeur	de	cette	journée	marathon. Ce	groupe	a	été	fait	pour	te	détruire	les	tympans	à	vie,	et	c’est	tout	simplement	jouissif	» RICARD	SA	LIVE	MUSIC	– LE	PRINTEMPS	DE	BOURGES,	BOURGES	2016 "It	It	Anita	just	blew	our	collective	minds	at	Queens	Hotel. Highly	recommended” The	Latest Music	Bar	– THE	GREAT	ESCAPE,	Brighton	2016 “These	Belgians	absolutely	tore	it	up! This	was	their	first	ever	North	American	appearance	and	we	were	lucky	enough	to	catch	it.” PunKanormal	Activity	– FME,	Rouyn	2017 By	the	end	of	2017,	after	a	first	memorable	gig	in	North	American	(FME	Canada), IIAA is	getting	ready to	take	the	road	again:	It	It	Anita	will	support	the	Irish	band	"And	so	I	watch	you	from	afar" on	a	big	part	of	their	European	tour. Following	this	fall	tour,	the	band	will	take	over	the	direction	of	the	studio	in	order	to	complete	the	recording	of	its	next	album	planned	for	summer 2018. Rumors	say	that	they	could	very	soon	release	a	first	single. To	be	continued	... New	album	will	be	out	on	august	31st 2018.